Ruled as King of Spain from 1556 to 1598 and Portugal from 1581 to 1598. He also ruled Naples and Sicily and served as both Duke of Milan and King of Ireland and England. He was taught Latin, Portuguese and Spanish growing up. There was a great amount of countrywide debt during his reign over Spain, including four different state bankruptcies. 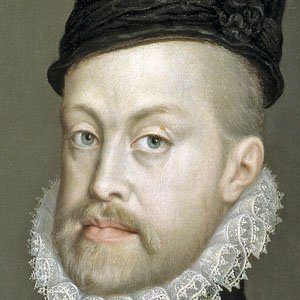 He was the son of Charles V of the Holy Roman Empire and Isabella of Portugal. He had great difficulty filling in for his father Charles V, who was a well-respected and celebrated ruler.